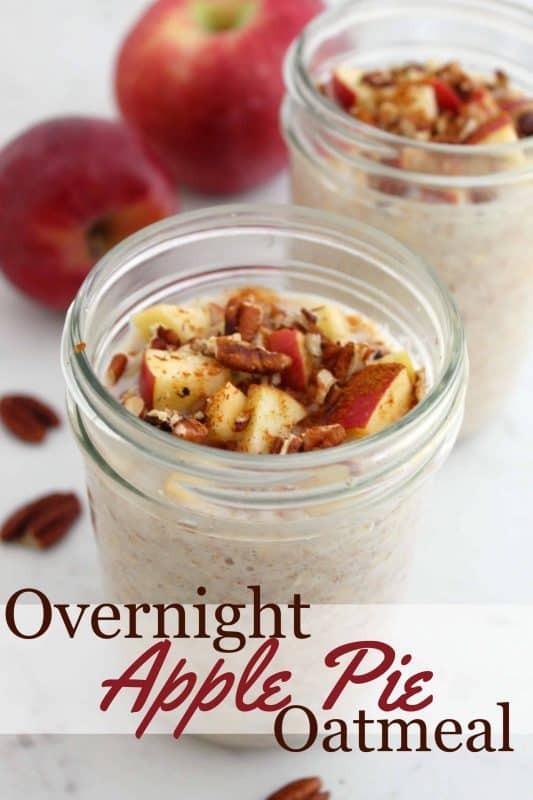 Overnight Apple Pie Oatmeal is a breakfast treat to crave! 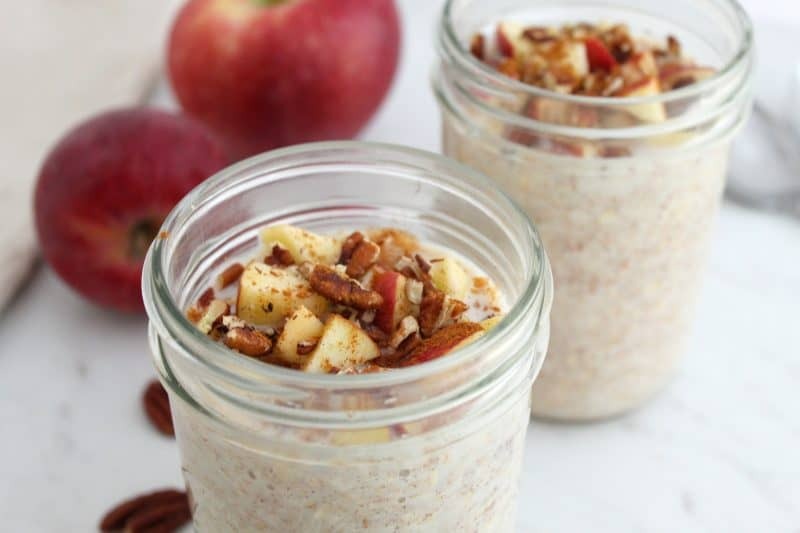 Overnight Apple Pie Oatmeal -These beautiful oats are creamy, flavorful, filling, and comforting. Even more, they’re made in one of the easiest ways possible – by sticking it in your fridge and going to sleep! I love the texture of overnight oats. They get nice and creamy, with the oats plumped up just right. You can eat them cold or heat them up to have warm if that is your preference. These have an amazing depth of flavor and unlike flavored instant oats that you buy, you actually know where all of the flavor is coming from. It’s no secret I’m an avid oatmeal lover. In fact, I once spent $25 for a bowl of oatmeal in New York City. Gasp. Horror. I know. Hang in there with me though because there were extenuating circumstances. I was there to be on the Today show, in this fancy hotel right across from the Rockefeller Center. I had flown in the night before, into a blizzard. People at my local airport just about had to move mountains for me to be able to get into the city and once there it was a little uncertain as to when I would even be able to get back out. I went straight from the airport to the studio to do my walk through and then walked to my hotel. I’m not much of an explorer, especially when I’m traveling on my own. I’d much rather sit in a room by myself and read. So that night passed uneventfully and I went to bed soon after arriving since I had to be there so early the next morning. I can’t remember the exact call time but I’m pretty sure it was in the 5:00 AM vicinity, and y’all know I had to allow ample time to have my hair and makeup done before showing my face to the outside world so that’s getting up around 3:00. I had a couple of hours yet before my live television appearance and this Alabama gal needed a little something on her stomach. I’m not about to go out exploring at 4 in the morning in an ice covered New York City. Instead, I picked up the room service menu and looked for my old faithful, oatmeal. There it was, just waiting to be ordered – for $25. Y’all, I am not kidding. Now you’re probably thinking the same thing I was! I could go find a field, plant some oats, water ’em, harvest ’em, roll ’em myself between rollers I carved out of a tree in my back yard, and still not have spent $25 on the process. I could buy enough oats to feed my family for months on that. But my plans for the day included making fried pies on national television and then heading straight back to the airport again and this was my only opportunity to make sure the growling of my stomach didn’t take over the studio microphones – so I ordered it. In their defense, they did bring it under one of those fancy silver domes at least and there were a few berries on top. I made sure to eat every bite of that because at this point I figured each bite was worth at least 2 bucks! I tell you what, though, once you’ve paid that much for a bowl of oatmeal you definitely appreciate every bowl thereafter. After that trip, I started carrying packets of instant oats with me whenever I traveled. Lesson learned. 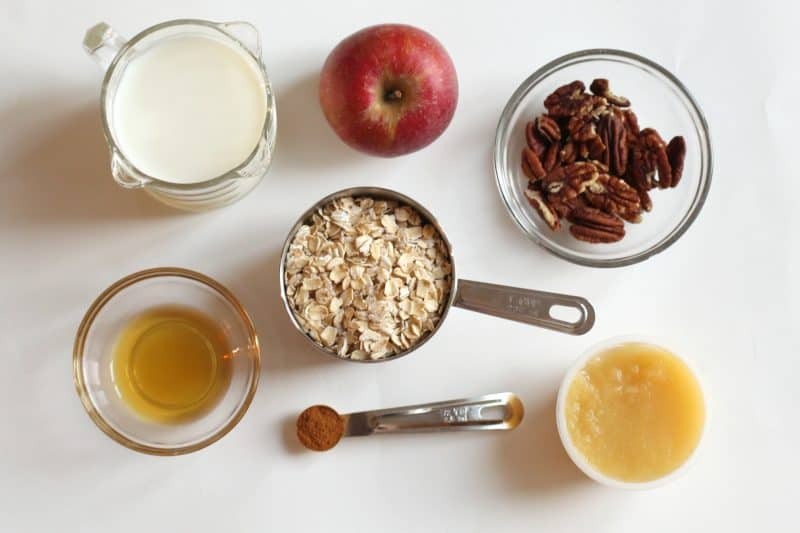 Now, let’s make some oatmeal that will run circles around a fancy hotel’s $25 bowl any day! For the toppings, which are optional, you can add a chopped apple, some pecans or walnuts, and a little extra cinnamon. *You can use quick oats if you prefer. Gluten free oats work as well. *Milk – your favorite type of milk will be fine in here, including 2%, skim, or even unsweetened almond milk. 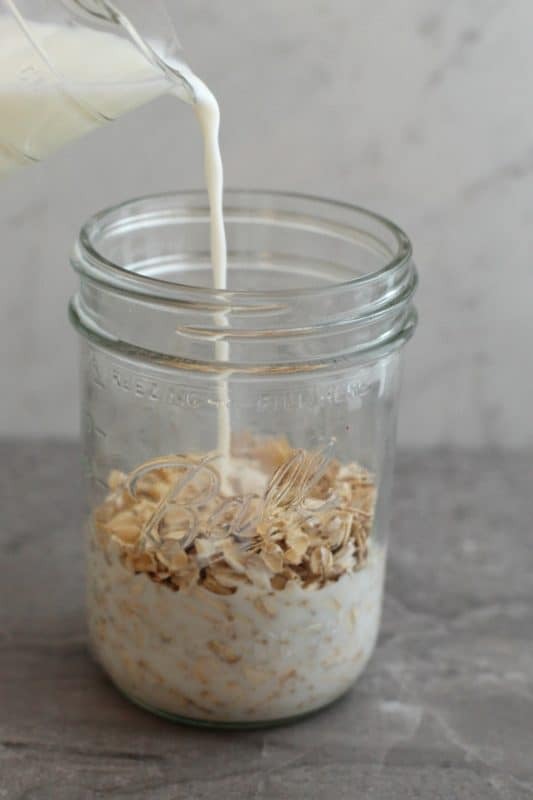 Place oats in a 16 ounce mason jar. Pour in milk. Add applesauce, molasses or honey, and cinnamon. Give it a stir or put the lid on and give it a shake. Place this jar, with lid on, in the refrigerator overnight. In the morning, your oats will be plump and thick, ready to eat! I like to top them with chopped apple and pecans or you can eat them as is. They are great cold or heated up like traditional oatmeal (which is how I eat it). I hope you get to enjoy this wonderful overnight apple pie oatmeal! In the morning, your oats will be plump and thick, ready to eat! Top with chopped apple and pecans or you can eat them as is. They are great cold or heated up like traditional oatmeal. Check out my Low Sugar Banana Oat Muffins by clicking here! Is this one serving or two? Sounds yummy! This is for one serving but it makes about two cups so it could end up being two depending on how much you normally eat 🙂 With me, it kinda depends on the day! Good story Christy!!! I think we just might be ‘sisters’ !!! What a blessing that would be for me! Just curious if fancy hotel rooms in NYC have little refrigerators and microwaves in them. Do you travel with utensils like I do? hey Jenny! I try not to travel anymore but back when I did, after this incident, I started bringing a little “kit” with me that had a plastic fork, spoon, knife, some little Irish Breakfast tea bags, a packet or two of creamer, a few packs of sweetener, a package of hot chocolate, and some oats, lol. It saved me a LOT of money over the years. This hotel didn’t have any appliances in it whatsoever, not even a little coffee maker. Did you know you can make your own apple molasses? It would be perfect for this recipe! I buy three cans of frozen apple juice concentrate, and heat it on the stove in a heavy sauce pan, simmering until it has reduced by 1/2 to 2/3. I store it in a canning jar in the fridge until I need some. You can buy boiled apple cider online but Ooooooo, it’s expensive. Also good in pies and apple dapple cake- I add a Tablespoon and pump up the appley-ness of any recipe. Having a why didn’t I think of this moment! Wonder if you could freeze in cubes then. Add to water for flavored water?!? Yummmmm…. thinking of all the concentrated juice possibilities!! What a great idea Juliane!! Thank you so much for sharing it with us!! If you are out of applesauce, try apple jelly or apple butter for flavor. I use apple jelly in my apple pies. How do you heat yours up? Microwave? Yup, about a minute, be careful getting it out! Hey Cristy, how long to heat in the micro wave. I am thinking maybe on power 8 for 30 seconds and check to see if warm enough. 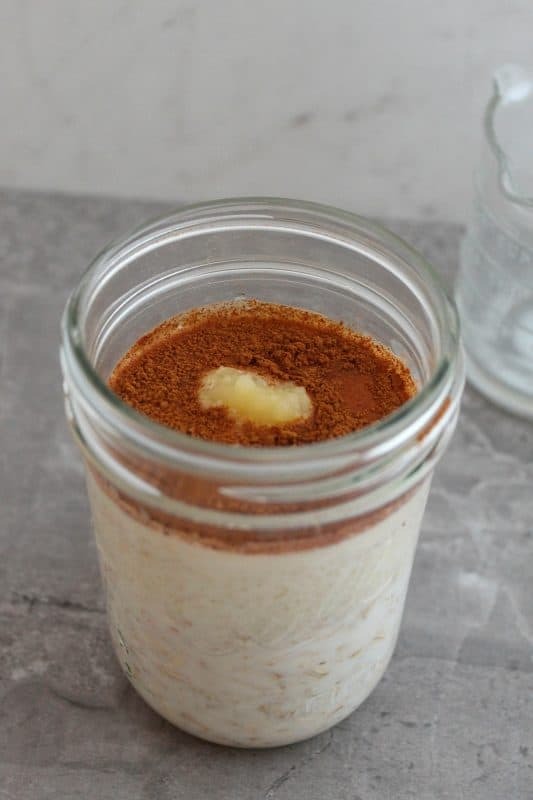 Thank you so much for having an overnight oats recipe that does not include chia seeds!! 🙂 You are VERY welcome Chrissy!!! Worth reading for the tip to carry packets of instant oatmeal! I also carry Hot Hands…saved my husband from spending the rest of our Moroccan vacation in hospital. Do you heat up the apples and the nuts, too or put them in after heating? My husband will love this! I prefer crispy oats, like in apple crisp. Have you got any breakfast recipes like that?